We talked a significant amount lately about bank performance ratios and the various sources for this data. 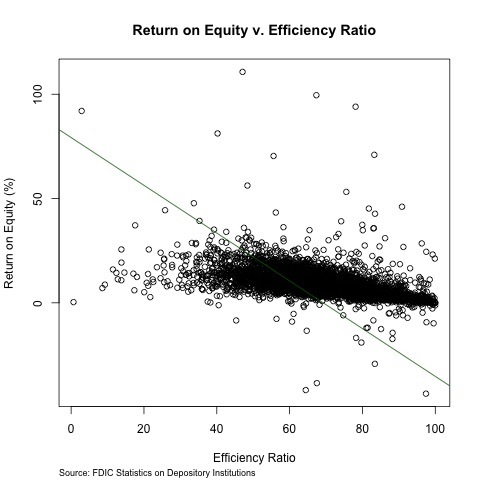 I grabbed bank efficiency ratio data from the FDIC Statistics on Depository Institutions for 2016 Q2 and plotted it against the return on equity (ROE). I did remove any banks with efficiency ratios above one hundred because there were some significant outliers. Students will recall this is not my favorite ratio because it is a bit too arbitrary and I think the graph bears this out. I added in a linear regression line. You can see that as efficiency ratio declines, ROE increases, which is a good outcome, and the relationship is statistically significant (with over 5000 banks I would hope there was a significant relationship). The regression line seems to miss a bunch with the data plots though, so I am not thinking this is a great model. At a very real level, a lower efficiency ratio (lower non-interest expenses as a share of revenues) should correlate with a better performing financial institution, and that can translate into better ROE performance (we talked about this measure too). However, it does not look like that is a guarantee from the scatterplot. Would estimating ROE using the efficiency ratio suffer from multicollinearity? Since they are both ratios of bank income I was thinking that might be a problem. Hope all is well at UND. I really enjoy reading the blog and hope to replicate with a focus on Iowa.